The last time we checked out a pair of high-end House of Marley headphones, it was none other than the $300 priced Destiny Series model, which featured active noise-isolation technology to mute background noise and have you focused solely on the music. Obviously, not everyone is going to want to unload that amount to experience something so grand, therefore, if you’re in that exact boat, you might want to check out the House of Marley Redemption Song On-Ear Headphones instead. Indeed, is $200 price point might still be perceived as excessive to some, but when Beats Audio headphones cost nearly the same, it’s not all that unconventional. Above all, we absolutely love the homemade look and feel of the Redemption Song headphones, as it employs earth-friendly materials such as recyclable aluminum, FSC certified beech wood, and durable canvas. In a world where futuristic industrial designs are rampant amongst on-ear headphones, it’s undeniably refreshing to find something that harkens back to something that looks as though fine labor and lots of love was put into its construction – instead of something that's churned out by a manufacturing line. With its cushioned pads, they’re comfortable enough to put over our ears, but it can feel a bit irritating after an extensive amount of time due to the tight feel of the headphones. When it comes to audio quality, its 40mm dynamic moving coil speaker drive produces a frequency range of 15Hz – 22kHz, which essentially churns out some quality tones that don’t sound strained at all. Rather, it delivers some punchy tones that have a lot of bite to make the listening experience pleasant. 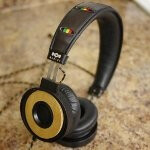 All in all, if you really want to stand out from the crowd, especially when those plasticy monster-type headphones are commonly used by people, the House of Marley Redemption Song On-Ear Headphones are a perfect fit – even at $200!